A friend of mine says these morbid thoughts are “the call of the deep.” Just don’t answer the call, he advises. It makes me wonder: why does death whisper to me so? Is it because imagining different deaths will prepare me for the real one? In Kate Atkinson’s new novel, Life After Life, she answers the call of the deep again and again, playing with death, reality, and the structure of a story. Near the beginning of the book, a baby is born with the umbilical cord wrapped around her neck. In beautiful language, Atkinson tells us: “No wind in the strangled pipe. The buzzing of a thousand bees in the tiny curled pearl of an ear.” The baby dies, and darkness falls. But then, the next chapter opens. Same characters. Same snow storm. Same turn-of-the-century British country house. But this time, the baby doesn’t die. The doctor gets there in time. “Such a fine line between living and dying,” the mother thinks. She names the baby Ursula. Atkinson plays with Ursula’s life in the most dramatic of ways. What if she were to drown at sea? (“Darkness fell.”) But in another version, Ursula is rescued. What if Ursula were to fall off the roof? What if she were to die of Spanish influenza? Ursula starts her life over again and again. Growing up, she has strange gut feelings, odd compulsions, memories of places she’s never been. Deja vu, people tell her. It seems that she is learning from each life, trying subconsciously to avoid the previous lives’ tragedies, although not always succeeding. The book continues, and Ursula’s alternative lives become longer and more complex. Little variations lead her in vastly different directions, as if we are following the paths of a choose-your-own-adventure book. In one life, she marries an abusive school teacher, dying at his hand. In another she works in London during the Blitz, rescuing bombing victims. In a somewhat unbelievable turn, she moves to Germany and becomes friends with Hitler’s mistress, Eva Braun. As I got deeper into the novel, it was hard to let go of Ursula’s previous lives and focus on the current one. But perhaps this is what Atkinson intended. At times I felt like Ursula myself: confused about reality and haunted by memories of other lives. It only adds to the confusion that Life After Life jumps back and forth in time. Chapters take place in 1910, 1930, 1944, 1967, etc., and not always in chronological order. Since I didn’t tend to pay attention to the dates on each chapter heading, I was often disoriented at the start of new sections. As a writer (struggling to write my own novel), I was fascinated by the structure of Life After Life. How in the world did Atkinson keep track of all the different versions? I have enough trouble keeping track of one! Currently I have written 160 pages of a novel and am starting to feel overwhelmed — and I stay in one time period, with one version of reality! This is the way it always is for me: beginnings of novels are fun and easy, but the middle is where I sag. Around 150 pages is usually the point where I get confused and frustrated and say “maybe I should start all over.” I wonder, did Atkinson get confused as she slogged through the middle of Life After Life? The beauty is, she did start all over. Again and again. Whether Atkinson was confused or not, I think she meant for her readers to be somewhat muddled. She wanted to give an overall impression of a life instead of a neatly linear story. And it worked. I came away from the book with a good sense of Ursula and her life (or lives). The personalities of Ursula, her friends, and her family members don’t change from life to life, and Ursula often ends up having similar experiences, coincidences, and emotions, no matter which life she is leading. 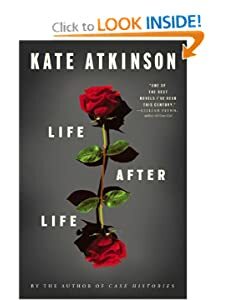 This is the most impressive part of Life After Life: that the intricately-detailed world Atkinson has created manages to hold its shape throughout all the different versions. Some things will always be a reality, she seems to be telling us, no matter which life you have. I felt similarly about this book as I do about the novel I’m working on: enchanted by the beginning and confused by the middle. The end was a bit disappointing and left me scratching my head, but, after all, how can multiple stories finish in a single way? Perhaps I was expecting a clear explanation – perhaps that’s my problem with my own writing, too. But all-in-all, I enjoyed Life After Life. It is sharply written and vividly imagined. I was intrigued by Ursula’s sessions with her psychologist and delighted by the witty and richly-layered dynamics of her family. I recommend reading it, but you should go into Life After Life knowing it is not a normal novel that can be wrapped up neatly. There is no real beginning, middle, or end. There are many of each. It reminds me of a creative writing class I took as an undergraduate. The professor told us we couldn’t kill off our main character, and, like a good girl, I have stuck to that rule in my writing life. “What if I kill my main character?” Kate Atkinson must have wondered one day. “What if I do it again and again?” In a way, Life After Life is an experiment in storytelling. And the story is about the fine line between life and death. It is a story about the fuzziness of reality and the intricacies of experience. It is a beautiful answer to the call of the deep.